Day Camp at Plum Creek is a Christian adventure camp for elementary and jr. high children. We are located in Plum Borough and easily accessible. We offer ACCT certified Challenge Courses include collaborative low-ropes, climbing walls for beginners and experienced climbers and long Zip line. Our challenge courses will be faithfully supported by a team of ACCT certified staff. As Christ supports our climb in faith so do our trained staff belay the climbs up the beginner’s wall and the climbing tower. *Jr. High camp is also offered this week. NEW FOR 2019! We are excited to announce that registration is available online for Summer 2019. Now you will be able to register, complete forms, and pay through our online software. Thank you for your patience as we prepare and fine-tune this system. If you are planning on utilizing the multiple week or multiple child discount please note that these will appear at checkout. Click here to register for camp now! If you would like to apply for a Financial Assistance Scholarship, please be sure to do so before registering for camp. Applications can be downloaded using the button below. Please print, complete, and return the form to faith.plumcreek@gmail.com or 550 Center New Texas Rd, Pittsburgh, PA 15239. All applications are confidential and reviewed by the Day Camp Board of Directors. Throughout the week campers will work with each other building trust, collaboration, faith and friendships. In addition to the challenge courses campers will have mountain boarding, crafts, water games, drama, music, environmental appreciation, Bible study, team sports, and all new games and adventures. Interested in applying for a summer job? Summer Day Camp would not be possible without a team of dedicated, energetic staff to guide the campers through their week! The Day Camp at Plum Creek is currently hiring high school and college-aged students who are excited about working with children and youth in an outdoor setting. Staff will be trained in leading camp activities, working with different age groups, facilitating adventure activities, guiding faith formation, and even more. All skills gained at camp are transferable to everyday life and great resume builders as well! We currently have openings for Junior Counselors, Counselors, and a Program Assistant. Click the links below for descriptions of each position then use our online application to apply. We look forward to meeting you! Day Camp at Plum Creek will begin hosting one day retreats and overnight retreat options. Your church camp may be interested in renting our challenge course. Day Camp at Plum Creek now offers even more ways to connect with us. Find us on Facebook and Instagram to keep up with us all year long! A vision of Rev. Dr. Jack Lolla, the dream for a summer Day Camp with challenge courses at the Presbyterian Church of Plum Creek began in 2004. The equipment was purchased, installed with ACCT certification, and had its first summer season in 2007. The goal of the new day use camp and challenge courses was to bring greater awareness to campers, participants, and youth leaders about the love of God experienced in a community through physical challenges & cooperation, Bible stories, environmental awareness, and having fun together. Countless Plum Creek volunteers cut paths into our hills, distributed bark, leveled rough places, improved access to our creek, and made our church grounds into a unique ministry experience in Western Pennsylvania. Team building skills are an avenue to building disciples of Jesus. Utilizing staff from many area churches encouraged ecumenical relationships and openness. The Day Camp is committed to multi-national, multi-racial children and youth from all over. 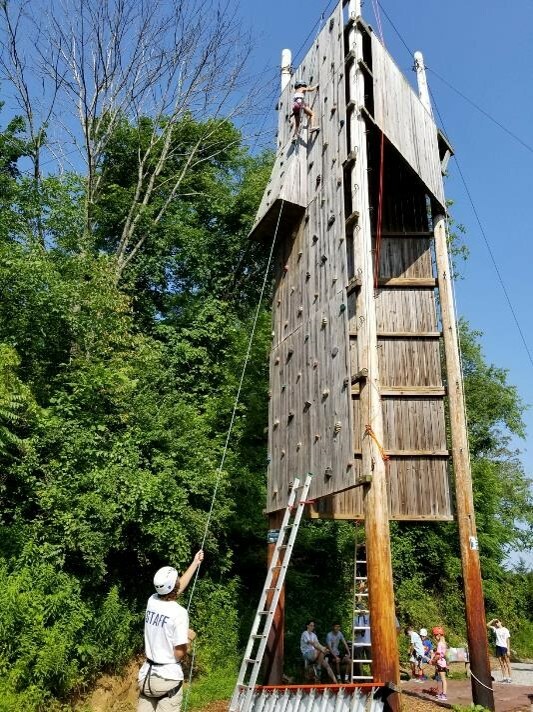 The challenge courses, four story climbing wall, and zip-line are the heart of the Day Camp, teaching children and youth to cooperatively help one another navigate obstacles and challenges presented in the courses and in life. Qualified and certified staff counselors are hired each year to share faith and provide positive group experiences. Our staff counselors return year after year as do our campers. In 2018 the Day Camp hired its first full time Director of Day Camp, Faith Bailey. The Day Camp is overseen by a 501c3 board of directors made up of members from the Presbyterian Church of Plum Creek and other organizations. Faith, Fun, and Fellowship will be found in abundance at Day Camp! Sign up with your email address to receive news and updates about Day Camp at Plum Creek.